Home › Top › Big news from IMS Ibiza! Big news from IMS Ibiza! We received from our friends of IMS Ibiza..and we are happy to publish this press release! If you are in ibiza don’t miss it! “The countdown to this year’s highly anticipated International Music Summit begins with less than 2 weeks to go. Back for its seventh year, IMS returns to Ibiza for 2014 at the new Hard Rock Hotel Ibiza with a speaker line-up assembled of influencers and opinion leaders from every aspect of the electronic music industry including artists, labels, executives, managers, agents and much more. Final tickets are on sale now and Friday 9th May is the last day to submit information to be included in the delegate manual. Joining the burgeoning list of speakers will be Ministry of Sound’s Chief Executive Lohan Presencer who will be opening the summit with a State of the Nation Keynote Address. It is the first time a representative from Ministry have spoken at the IMS event. Vice-President of Warners, Seymour Stein will feature in a Keynote Interview about his life with IMS partner Pete Tong. Also confirmed is Boy George who will be contributing to the talk to mark 20 Years of Wall of Sound which will delve into the history of the legendary record label and the scene around it. 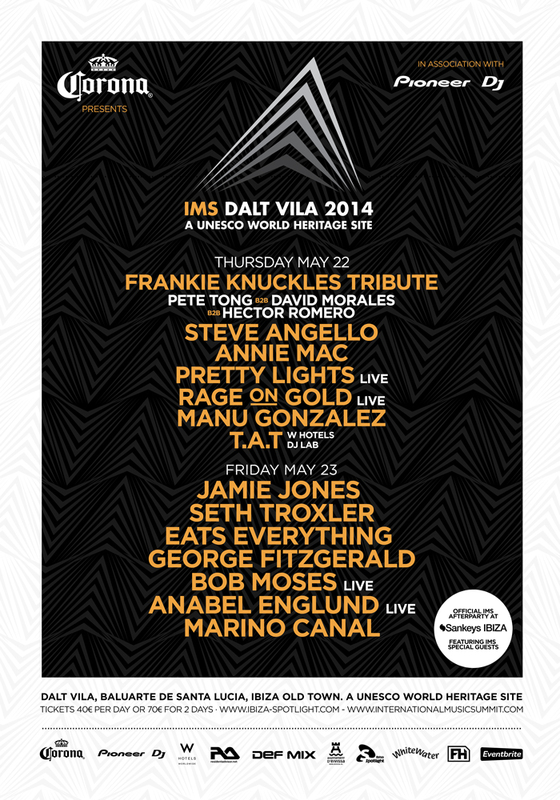 Newly added to the IMS Dalt Vila line-up on Thursday 22 May is a special tribute to the Godfather of House, Frankie Knuckles. To honour the untimely passing of a true innovator and inimitable pioneer, IMS founder Pete Tong will be going B2B with David Morales and Hector Romero. The long-term manager of Knuckles, Morales and Romero will also attend – Judy Weinstein, a previous winner of the IMS Pioneer Award. Continuing the annual IMS Anthem tradition – where the track is made and remixed in front of the delegation – this year will see Derek Vincent Smith aka Pretty Lights create the tune of the summit. Pretty Lights is one of America’s biggest electronic success stories – selling more hard tickets in America than almost any other ‘live’ artist from the electronic scene. On remix duties is none other than MK, one of the hottest remixers of recent decades. MK has re-worked tracks by everyone from Lana Del Rey to Disclosure. With a number 1 UK single under his belt for his Storm Queen, Look Right Through remix, the IMS Anthem is certain to be something special. The IMS Anthem is run in partnership with Point Blank music school – who will also talk on a special panel at IMS titled Education Education Education. IMS is pleased to announce that The Hepatitis C Trust will be returning as official charity partner for a sixth year. As part of their mission to raise money and awareness of Hepatitis C, the Trust will be auctioning off exclusive artwork from Ronnie Wood, Goldie and award-winning street photographer Dougie Wallace. The International Music Summit has become a must-attend event for all electronic music lovers around the world. The three-day electronic music and technology-driven summit, which has earned a reputation as ‘the TED of music conferences’, will bring together the genre’s most important and influential decision makers. This year’s theme is ‘Filtering the Future’– in a world of overload, how do things manage to cut through? ‹ Tonight, Pacha Ibiza… Muss- Eum, with Sergi Mussa, Gaty Lopez, Efrain Navarro and Victor Nebot!